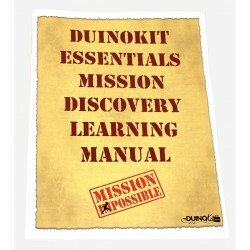 Parts and Components Collections - DuinoKit - Educational Electronics Learning Kits. 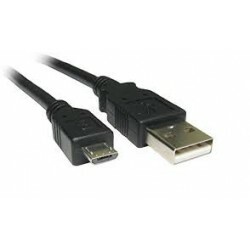 [QUOTE]no, it won't work on my uno or nano. same issue. has the code been updated yet? The icon above will allow you to connect your RPiKit (Raspberry Pi) to the local WiFi network. Making code updates sohortly. Will supply in a .ZIP file that includes the library. I put the DS1307RTC in the libraries folder. The sketch compiles, but nothing appears on the lcd. It is backlit but does not display any information. Parts and Components Collections There are 5 products. Arduino compatible NANO microprocessor as used in the DuinoKit Essentials and the DuinoKit Jr. 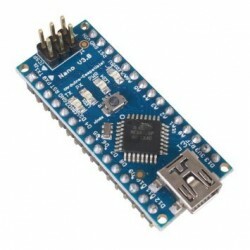 This version uses the FTDI chip on the programmer circuit and it a replacement to the NANO shipped with the DuinoKits. 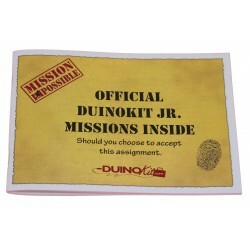 Mission Booklet for DuinoKit Jr.
20 Mission Booklet specifically designed for DuinoKit Jr. 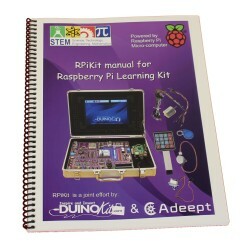 This booklet is included with each DuinoKit Jr.
Lay-flay coil bound manual for wiring components for Raspberry Pi Learning Kit (RPiKit). This manual is included with each RPiKit.